The Villars Tourism website provides comprehensive details of the range of accomodation options available in Villars which includes hotels, guesthouses, self-catering and catered chalets, mountain huts and, as Villars also offers plenty of family activities in summer, camping. We have stayed in self-catering chalets and apartments in Villars and nearby Barbalouse since this type of accomodation is, in our opinion, the best choice for families. 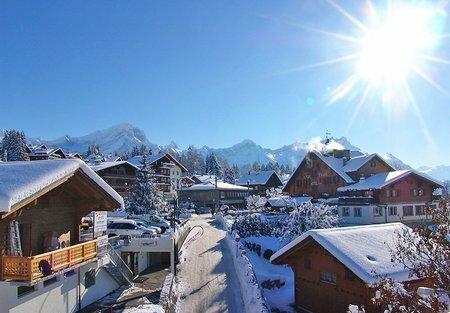 The ever helpful Villars Tourism website also provides details of how and where to book this accomodation, either through local letting agents like Villars Chalets or directly from the owners. Of the hotel accomodation we are only familiar with the Hotel Du Golf where some family members have stayed. As well as the friendly atmosphere this hotel probably has one of the best, most central locations, directly across from the train station from where the BVB also departs to the ski station at Bretaye.